SAN LEANDRO, Calif., Jan. 31, 2018 /-- iHear Medical, the leader in direct-to-consumer hearing aid solutions, announced today that it has partnered with FSAstore.com to offer the iHearTest, the first and only FDA-cleared home hearing screener, with reimbursement eligibility through flexible spending account (FSA) programs. Offering FSA reimbursement eligibility furthers iHEAR's mission to provide consumers with affordable and accessible hearing solutions. The FDA-cleared iHearTest has been clinically proven to accurately score hearing ability in each ear on a scale from 1 to 5 based on World Health Organization (WHO) guidelines. Anyone who suspects that they or a loved one is experiencing hearing loss can now purchase the iHearTest and reimburse the cost through their FSA program. Results of the iHearTest can be used to program iHEAR hearing devices, including the iHEAR HD and iHEAR MAX, based on a consumer's individual needs. 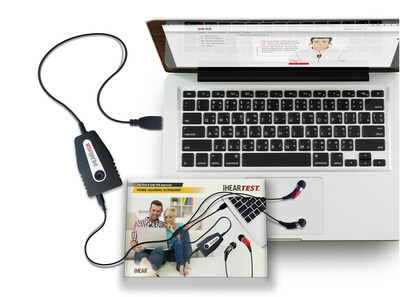 "We are excited that the iHearTest is now offered at FSAstore.com," stated Adnan Shennib, Founder and President of iHear Medical. "For people living with hearing loss, the availability of the iHearTest at this leading online retail outlet will offer additional access to our breakthrough hearing screening technology." Hearing loss affects more than 40 million people in the United States and is a contributing factor to severe socioeconomic problems, including depression, dementia, social isolation, and inability to hold a job. Prior to the iHearTest, there were no over-the-counter hearing screening products, making obtaining a hearing screening inaccessible to many who suspect hearing loss. With the iHearTest, iHEAR intends to increase awareness of hearing loss and break through persisting barriers preventing people from accessing hearing solutions. FSAstore.com is the only one-stop-shop stocked exclusively with FSA eligible products and services so there are no guessing games as to what is and is not FSA reimbursable. With FSA eligibility of the iHearTest, consumers now have flexibility in how they manage their hearing health. The iHearTest can be purchased direct online from iHEAR or through FSAstore.com, which allows consumers to also pay directly with their FSA debit cards. FSAstore.com was founded to make it simple and convenient to spend, manage, and use an FSA. FSAstore.com is the only e-commerce site stocked exclusively with FSA eligible products, eliminating any and all guesswork as to what is and is not FSA eligible. In addition to the 4,000 eligible products available, the site offers educational resources for FSA holders, including the most comprehensive Eligibility List in the industry and a Learning Center with answers to the most common FSA questions. FSAstore.com accepts all FSA and major credit cards, offers 24/7 customer service, two-day turnaround for all orders and free shipping on orders $50+ in the continental U.S.